With ever-changing menus that combine fine cuisine with authentic local flavours, a Viking cruise is a culinary adventure. Breakfast on the Aquavit Terrace: a freshly squeezed smoothie, with the ocean all around you. Lunch at the Pool Grill: a gourmet burger under the sliding glass roof, open to the blue sky. Dinner in The Restaurant: sautéed Chilean sea bass, with the folding doors open to capture the sea breeze. 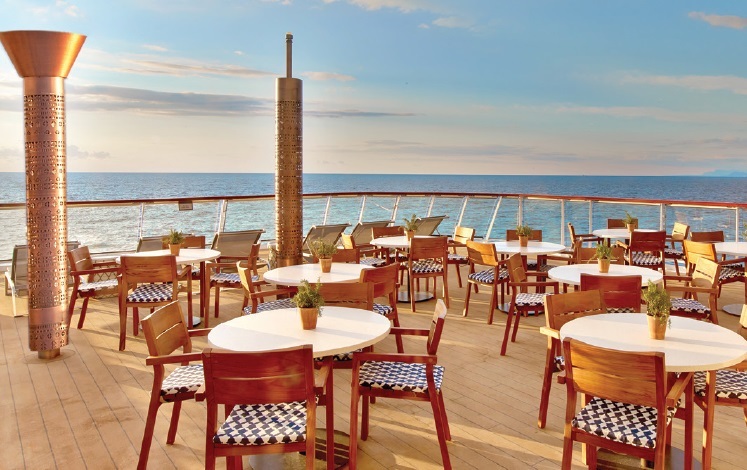 Viking’s beautiful new ships have more places to eat alfresco than any other vessel of their size. After all, what’s the point of being at sea if you can’t see it? The menus are as mouthwatering as the venues. Smoothie not enough for breakfast? Then ask for a cooked-on-the-spot omelette with crispy Canadian bacon. Burger too filling at lunch? Perhaps calamari and shrimp carpaccio with olive caper sauce will fit the bill. Prefer meat to fish for dinner? The Tuscan steaks in Manfredi’s Italian restaurant are fast becoming legendary. Considering the smaller size of Viking’s ships, the variety of restaurants and food on board is extraordinary. The word “buffet” does not do justice to the World Café, an airy space suffused with the aromas of carving joints, sizzling seafood and exquisite sushi. Carry your choice of treats out to the adjacent Aquavit Terrace and a waiter will appear to offer you complimentary wine or beer (don’t forget to pop back inside to grab some home-made ice-cream). 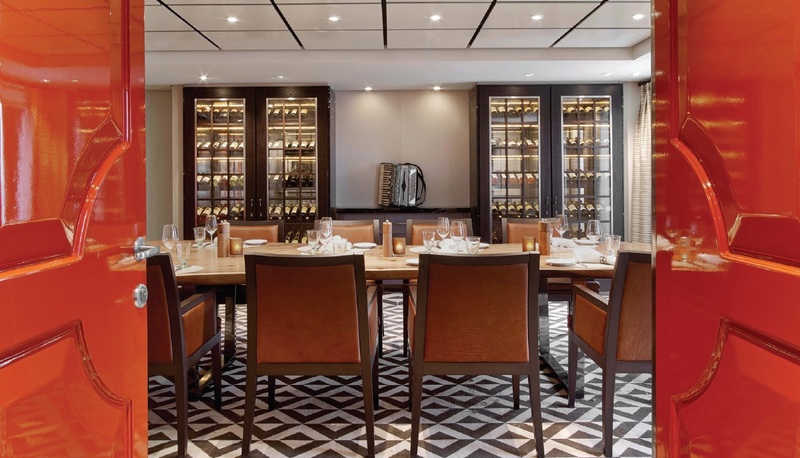 In The Restaurant, the menu features the likes of crab soufflé, seared calf’s liver, filet mignon and, at least once on every cruise, lobster thermidor. 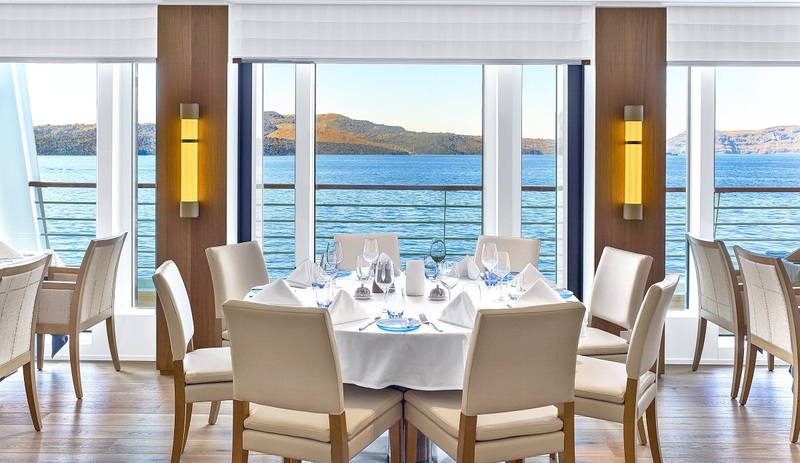 And there’s no extra charge to indulge at two of the finest restaurants at sea. At The Chef’s Table, the ship’s talented chefs create five courses of foodie heaven in an elegant setting of blond wood and eye-catching art. With eight rotating culinary themes, you might enjoy goat’s cheese baked in pastry on French night; cod fillet with artichoke risotto as part of the Venice Carnival experience; or grilled scallops with passion fruit from the Sweet & Salty menu. Naturally, each course comes paired with a different wine, chosen by the sommelier. Juicy and delicious, the burgers and hot dogs at the Pool Grill are a taste of decadence that everyone deserves on holiday, but remember to leave room for freshly baked scones with clotted cream – an essential part of afternoon tea in The Wintergarden. Mamsen’s deserves a special mention. Open for breakfast, lunch and late-night snacks, this little deli is inspired by the mother of Viking Cruises’ chairman, who has passed on her recipes for Norwegian staples such as griddled waffles. But cruising – especially with Viking – is all about discovery, and wherever your ship takes you, its chefs will use local ingredients and recipes to bring the true flavours of each destination on board – whether it be a rich lamb stew off the coast of Croatia, traditional bacalhau when leaving Lisbon or a zesty stir-fry with lemongrass in the Far East. Finally, Viking’s culinary magic comes in three more helpings. Both Manfredi’s and The Chef’s Table have private dining rooms for groups or celebrations at no extra charge, or you can book an optional excursion at The Kitchen Table, a gourmet event in which you accompany the chef to a local market, choose the ingredients and then help to turn them into a truly memorable feast.